The aftermarket fork hop-up business has essentially been non-existent since the days of bolt-on arches and Total Air cartridges, a fact that's surely down to the majority of suspension brands not leaving much room for improvement these days. 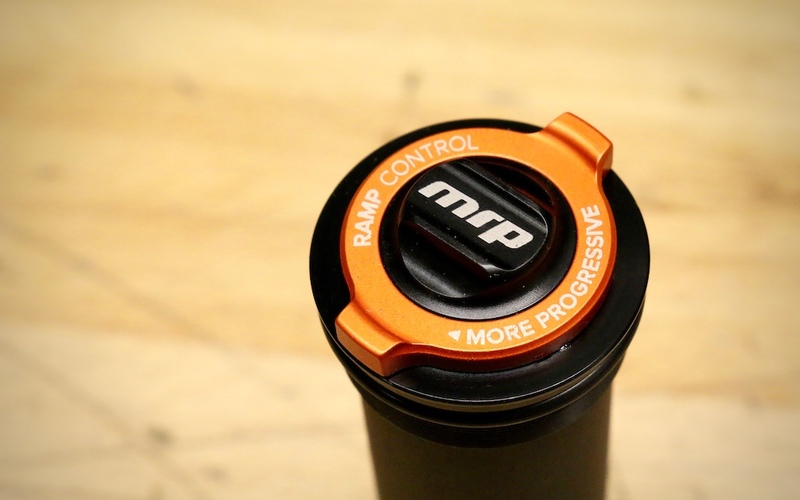 MRP, however, believe that isn't the case, and they've come up with a clever looking system that replaces your fork's air spring top cap and tokens with a cartridge that does the same thing while offering tool-free external ramp-up control. 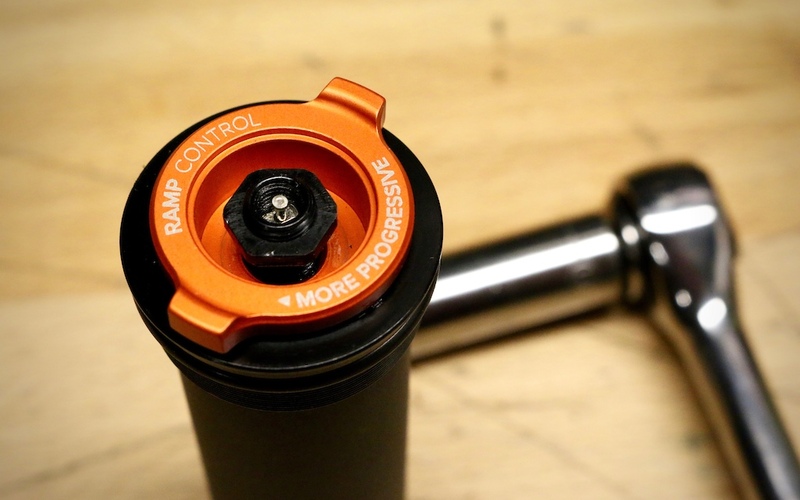 The appropriately named Ramp Control Cartridge replaces your fork's top cap and volume-adjustment tokens, and the 56-gram unit retails for $139.95 USD. 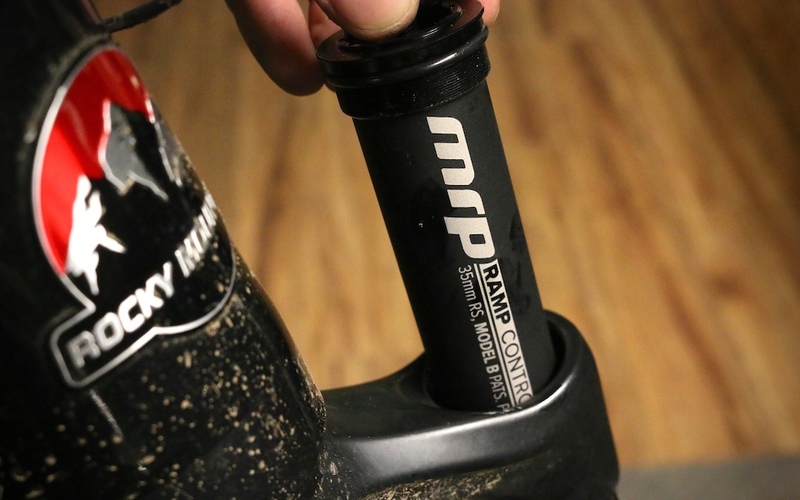 MRP offers a bunch of versions to fit different models ranging from cross-country forks with 32mm stanchions to forks with 34 and 35mm upper tubes, and travel from 90mm to 180mm. MRP is also working on Ramp Control upgrades for downhill forks, which I can see being popular among racers. Check out the compatibility chart below to see which version works with what fork model. 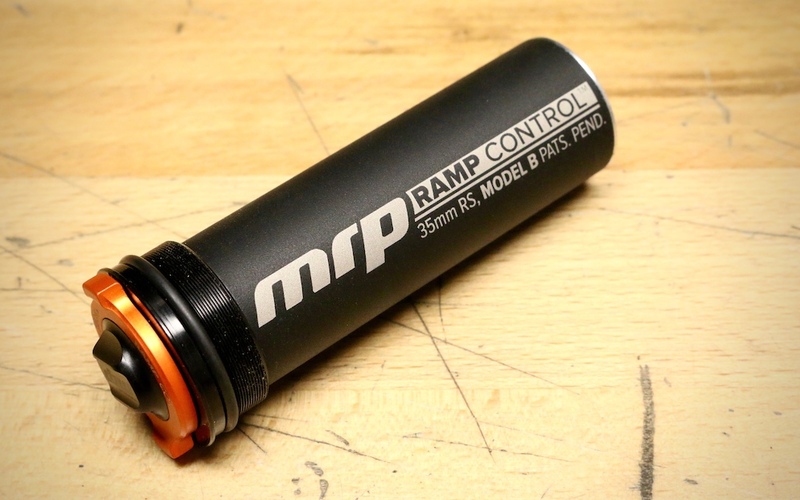 The Ramp Control Cartridge weighs 56-grams, which is just 5-grams more than a Pike top cap and two Bottomless Tokens. To best understand how the Ramp Control unit works, remember that air is a mixture of gasses that, while extremely thin, will still put up some resistance when forced through an extremely small hole or port at a high rate of speed. So while air does act differently than oil, you can think of it in kind of the same way in that oil is forced through ports and shims to provide damping. In fact, there have even been dampers that used air rather than oil, although that was many years ago now. When we think of adjusting air volume to tune ramp-up, we're probably picturing some sort of system where the physical volume of the air chamber is altered by turning a dial to move a piston up or down. And, with a sixteen-position dial on top of the cartridge, it looks like that's the method MRP have gone with... but they haven't. Instead, the anodized orange knob adjusts the preload on a small port at the bottom of the cartridge. More preload means that it requires more force for air to enter the cartridge, and you'll therefore have more bottom-out resistance. Less preload allows air to transfer from the fork's normal air chamber and into the cartridge easier, so you'll have less ramp-up. The rod down the center of the cartridge passes air into the fork's air chamber, and the dial adjusts the preload required for that air to enter the Ramp Control Cartridge. Getting the Ramp Control unit into your fork isn't difficult, but you will need a few tools and some common sense. The first thing you'll want to do is write down the air pressure that you're using pre-Ramp Control Cartridge, just as a place to start from once it's installed. Next, let all the air out of your fork so you don't lose an eye when you remove the top cap (with a socket wrench, not an adjustable wrench as I used), and then back it out of the fork. An 11mm aluminum nut hides access to the cassette tool interface under the orange dial. 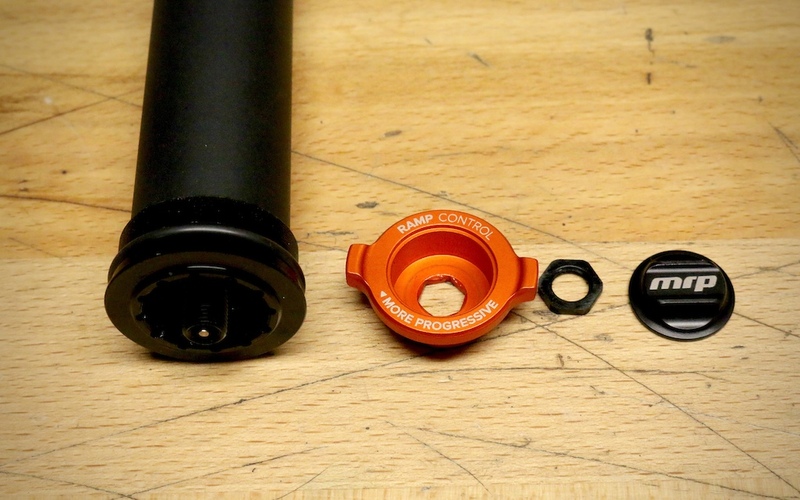 You need an 11mm socket to back off the aluminum locknut that's hidden under the cartridge's air valve dust cap, and backing the nut off allows you to lift the orange dial up and off of the cartridge to expose the cassette tool interface. A cassette lockring tool is needed to thread the cartridge into the fork to the correct torque spec for whatever fork you have (I'm sure you'll be using a torque wrench, right? Right.). Next, drop the orange knob back down onto the cartridge and then thread the aluminum locknut back down over it by turning the 11mm socket with your fingers rather than the wrench. Being aluminum and that its only job is to hold the dial on, this nut calls for just 2Nm, which is next to nothing. If you use a wrench, you'll likely damage the nut, never forgive yourself, and live in shame forever. If you didn't bust the nut, you can now pump the fork back up and call it done. The cartridge drops right into the fork. Total installation time: less than ten minutes. 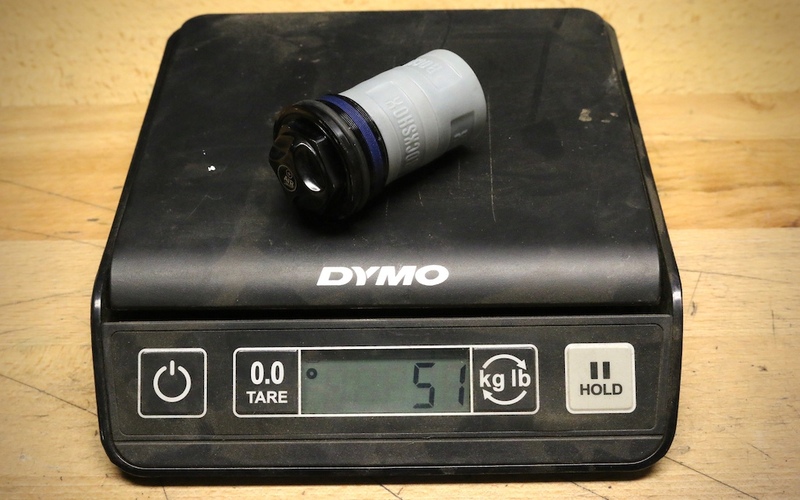 I dropped the Ramp Control Cartridge into a RockShox Pike that, depending on where I was riding and my level of courage, had seen anywhere from one to four Bottomless Tokens installed inside of it. So I was familiar with how the fork felt with a single volume spacer, but also with how it ramped up when crammed nearly full, with me preferring the latter setup for the majority of my riding. It's not that I'm constantly sending my bike and body off of large moves, but I do far prefer more progressive suspension that provides feedback and something to push against. MRP says that when the cartridge is at maximum progression, it's approximately similar to four tokens, but I wanted to start at the opposite end of the range before going all the way to the other extreme. When the orange dial is backed completely out, the progression is very similar to when the fork had a single token installed, which is to say that it's relatively linear and that I could get full travel (at the same pressure I was running with the stock setup) a bit too often for my liking. 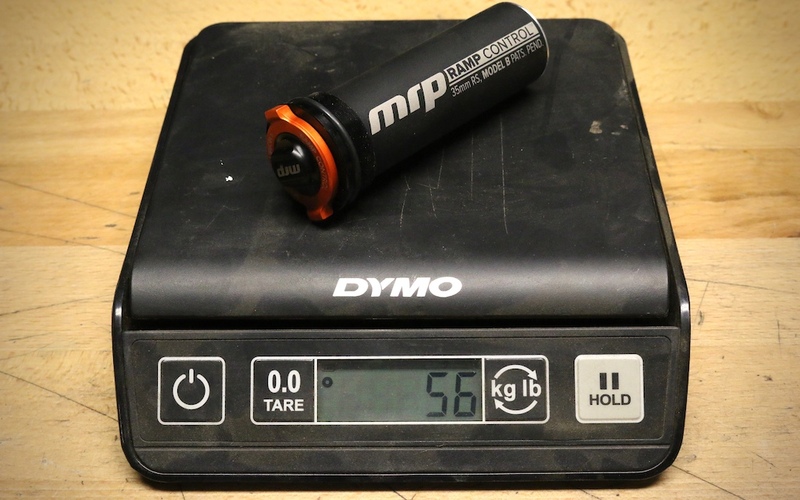 If I was on the mountain and the fork had a single token in it that provided a similar feel, I'd likely reach for a shock pump to add 5 - 10 psi, a change that would equal less bottoming but also a less forgiving feel in the early stages of the stroke. Compromises. Instead, I turned the orange dial all the way in to see what maximum progression felt like. The result was me going from using full travel with a touch of hard bottoming on one particularly nasty landing to not quite using the fork's full stroke when coming down off of the same drop. But, since this move is probably the hardest impact that I'm likely to see on my local mountain, I thought that I should be using all of the travel but that it should be more of a soft bottoming moment than a hard one. Backing the dial out a few turns did exactly that, all without having to use a socket wrench to add volume spacers. 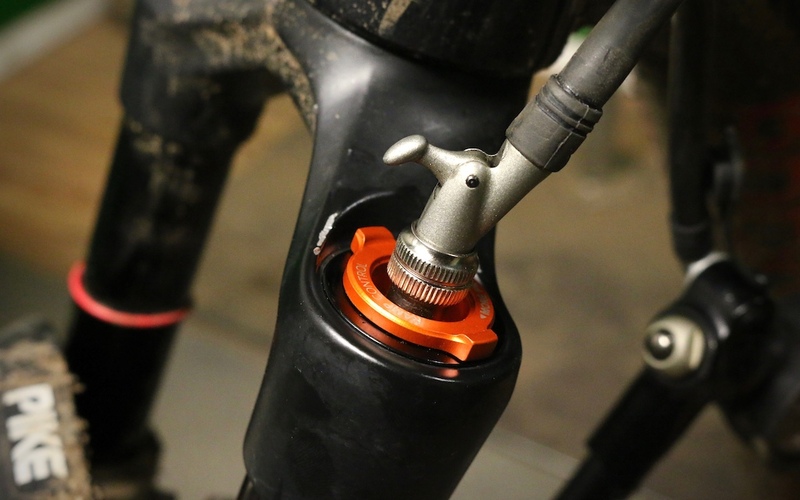 Fill the fork's air spring as per normal, and then adjust how it ramps up by turning the orange dial. After a bunch of tinkering, I actually ended up running 5 psi less in the Pike and had the Ramp Control Cartridge's dial all the way in, a setup that provided more sensitivity at one end of the stroke but just enough progression at the other. In other words, less compromise. MRP's trick cartridge is still inside of my fork after months of use, and I still play with the dial from time to time to adjust the fork's progression. Stopped reading after seeing the 5 gram weight penalty. 5g? 5 measly grams?! are you for real? do you measure the precise amount of water you need for a ride as well? How about shaving the tread off your tyres to save a few extra grams also? Stopped reading after seeing that it didn't have a water bottle cage. Stopped reading after seeing that it´s not enduro specific. @turkeybaconsmellybitches: Off course. Why? You don't do that? @turkeybaconsmellybitches: Fully agree with you, there are weight weenies and there's this guy! @turkeybaconsmellybitches: What the hell is going on here? British person getting schooled by an American on the art of sarcasm?? Poor show my friend. Poor show. Stopped reading at the end of the article. But is it BOOST and EAGLE compatible? @wolf-amongst-lambs: dangit wolf. I did what you said, not thinking for myself, and screwed up big time. You should have said we all need to DOWNVOTE. I just increased his neg prop figure. Are they going to make one for the 36?? @skookumsalmonarm: you want one for your slayer eh? @wallheater: ha-ha. I went to Southampton Solent. Not this course though, but it looks waaay more interesting than my business/finance degree. Ugh. 5g heavier. Orange but not Enduro specific. No waterbottle cage. You have to use tools to install it!?! Somebody at MRP is getting fired as I write this. Seriously, nobody who comments in the PB comment section would ever buy this. @wolf-amongst-lambs: what, like his user name wasn't a big enough clue? @Jimmy0: the range of tuning is 1 to 4 tokens.... check the chart. @turkeybaconsmellybitches has been downvoted to oblivion, his profile is gone. Poor guy. @Dan255: PB users are ruthless. @mcgetskinny: more embarrassing than brexit! 20 tokens under the air cap and you won't have to bother with air pressure anymore. And you'll have a super stiff fork. I'm down. So you're saying I can make my pike into an elastomer Judy? Sold. I want a more linear fork, can someone invent a cap that increase the air volume in my fork please? @abzillah: Just leave your shock pump attatched while you ride. @Tonyster2: @abzillah: I actually rode with a guy who used a length of tubing like that... said it made it much plusher. (protruded out the top of air spring leg, arched over and attached to top of other leg to keep it from slapping all over). Read "if you didn't bust the nut" and immediately scrolled to the comments. I thought the article was going to take a perverse turn. Disappointed. @mikelevy Will you be also testing the Vorsprung Luftkappe? Some comparison notes would be nice so we all can make a more educated decision on which of these two Upgrades may best suit an individuals needs. I currently run the Luftkappe but knowing the difference in what they both offer from each other makes answering questions from our customers at the bike shop a little easier. Also, something like this for a boxxer WC would be pretty awesome for the weekend warrior/racer. Being able to finely tune a set up for a race when you don't have a traveling mechanic is always a plus. These do fit into Boxxer World Cup 35mm forks! 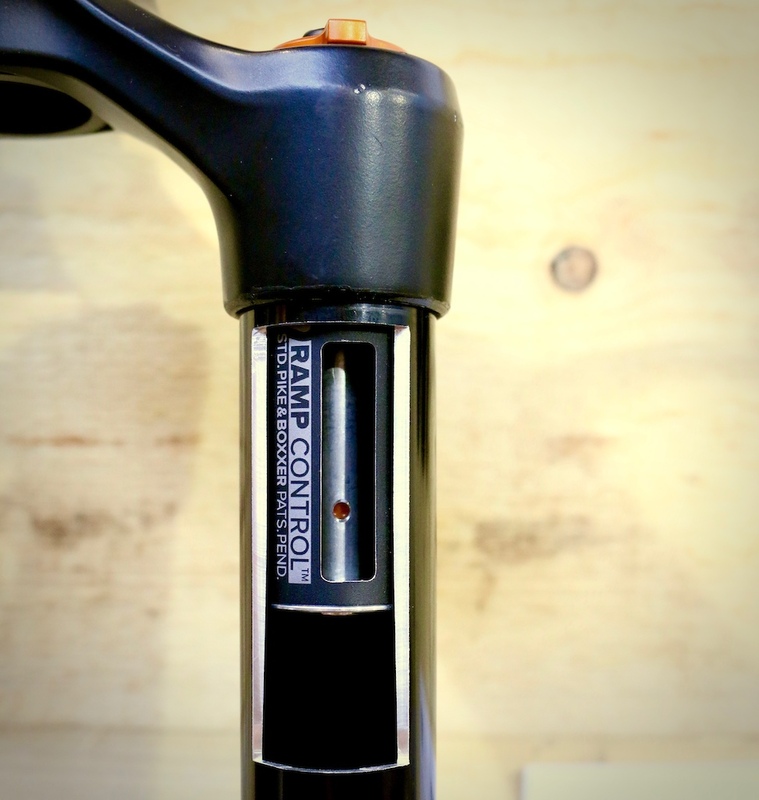 RS 35mm Ramp Control Cartridge Model A ...will fit 2013-2016 Pike forks with 15x100 axle spacing and 2010 and newer Boxxer World Cup (air-sprung) forks. Solo air models only. Recommended for 140mm+ 29”,27.5+, 26” and 27.5” forks. Just got a luftkappe over x-mas, looking forwards to sticking it in my lyric when the snow melts! Sorry, no report for you on it yet, but it looks quality! As for the MRP adjustable air spring, this comment isn't for anyone.. just typing whats in my head; As a 5 tokens in my pike kinda guy, I really enjoy the mid support you get from how progressive the spring rate becomes. When you're getting a bit wild in rough stuff I find these helps keep the bike's front end up and out of big holes. After seeing the graph with the spring rates it looks like you lose (I guess its just even more progressive then "x" number of tokens) that. @anthony3vans: The graph is a little misleading in that sense as it doesn't highlight the requisite air pressure changes required to achieve the same sag in the different setups (various token counts vs. Ramp cartridge) - it's a comparison of various setups at the same pressure. Look at the border between initial and mid travel in the graph - let's call that 33% sag (high for a fork, but a suitable reference for this discussion). You can see that a "token-heavy" air-spring would require more force to sit at that travel, that's why you'd need to drop your air pressure to get sag on par with a Ramp Control-enhanced fork. Furthermore, by adjusting the dial on the Ramp Control cartridge you can manipulate the spring curves behavior beyond sag point. You don't have that ability to decouple sag and spring curve with tokens. We'll work on a better graphical representation of what Ramp Control does. @anthony3vans: more tokens = less mid stroke. @ThomDawson: Spot on. At the same bottom out force more tokens provide far less mid stroke support. This gives the suspension a more supple feel in the mid strike by reducing the air pressure required to acheive the same bottom out. This reduction in pressure reduces friction which is what gives the supple feel. The trade off is that the front end starts to dive faster than the rear if it is too progressive. With air shocks and forks it is hard to ballance low friction with adequate mid stroke support since increasing support always increases friction, and decreasing friction always makes the fork dive into its travel harder. @NoahColorado: Cheers for the explanation, I'll admit that I only skim read the article and glossed over the fact that it doesn't actually change the volume of the air spring. (I was under the initial impression that this was just a quick means of essentially changing tokens out on the fly. I follow what you're saying. As a 170lb-ish rider on a 150mm pike w/5tokens and about 85psi I sit around 15% sag. Not the most typical set up, but I still use the full travel of the fork often. I would say in response to @ThomDawson I'm likely confusing midstroke with simply how progressive the fork is. @ThomDawson: haha, this is what everyones missing. unless you add enough that the mid stroke becomes the end stroke ramp up! @pacificnorthwet: I don't believe that air pressure and seal friction are coupled. No matter what pressure you are running in your air spring, friction due to seals should remain constant. Mid stroke support would be determined by the shape of your air spring curve, which is mainly determined by the size (volume) of the negative and positive air chambers. "decreasing friction always makes the fork dive into its travel harder" if this were true, everyone would be trying to increase friction. But the opposite is true. From my understanding, the idea is to decrease the friction in any suspension product as much as possible (increasing that plush feel) and then create an air spring with a low initial spring rate (initial steepness/slope of the air spring curve) to make things feel plush, and then increase that spring rate in the mid stroke for proper support, and no diving, like you mentioned. Products like the luftkappe do exactly this, plush initial stroke, more support and no dive in the mid stroke, and good ramp up at the end of the stroke. Hope this helps. @ih1358: / use a coil. I would love to see a return to coil in forks. There are some companies doing air spring conversions for popular forks (who'll match a coil to your current air pressure) and I heard murmurs of TF and Push doing the same. I think we may see a resurgence of coil in certain disciplines and we have already to some degree but it's for the front end I'd really like to see it make a come back - where there's less scope for leverage curves to help an air shock out and small bump performance is paramount to help keep the front end glued. Crconception can put a coil spring in many air sprung forks. @faul: yeah they were one of the companies I was referring to. Haven't heard many reviews from riders actually using them so if you've had any experience I'm all ears! I only have their open bath cartridge, as I never buy air sprung forks. i tested the luftkappe in my rockshox pike over the week end in finale ligiure. it is a great upgrade and in my opinion it has nothing to do with the mrp cartridge (equivalent to spacers). they change how the fork feels at the end of the stroke, whereas the luftkappe changes the whole feel to a much more linear feel, which i quite liked. I had problems with having too run too much pressure to prevent the fork from blowing thru and i did not have the small bump sensivity i wished for. @r0bb: Thank you for this comment. Being from Germany, do you have any experience with the AWK kit? What do you think about that? @magiko9: two friends of mine have the awk kit. I did not want it because 1. doesnt increase the size of the negative airchamber thus beginning of the stroke will stay the same more or less. 2. more expensive. 3. too complicated, i do not want to fiddle around all the time with 2 seperate air pressures, luftkappe is much easier too handle, less things that can break/not work properly etc. Midstroke support was a real bugger for me . now this is fixed and it is more smooth at the beginning of the stroke. Having said that, I only rode a AWK pike for a couple of meters on the trail, so no direct comparison. But for me, luftkappe is best i think. Before luftkappe came out I was thinking about the fast cartridge, which is really interesting, too. @r0bb: Thank you for sharing your opinions. I myself was thinking about the Fast cartridge too but that is really expensive. Yes AWK is a little complicated to handle, but it seems to be much easier to install personally. But as you mentioned Luftkappe is easier after, cheaper and also increases the neg. chamber. I have 2 pikes on 2 bikes now so maybe I can get both and try We'll see. @r0bb: I ride the AWK for a few months now and it changed the small pump sensitivity too because I can ride the fork with 15 psi less air pressure than before (85 psi without AWK, 60 psi with AWK). Midstroke support is way better, too. I always compare the AWK with the situation a few years ago, when I did a SSD upgrade of my computer. I never had such a performance benefit with such less work and such less money. @anthony3vans: Yeah Steve from Vorsprung was giving MRP credit for their simple-yet-sophisticated system, I believe he said 3D modeling would really be required to show the complexity of RCC's performance. Thanks to Noah, Steve and their crews not only for quality products but also great customer service. "Getting the Ramp Control unit into your fork isn't difficult, but you will need a few tools and some common sense." If you're relying on people to have common sense these days to install your product you're customer service department is going to be mighty busy. I'm tempted just so I can use a cassette tool instead of the annoying socket. If only they made some kind of mod for the damper. Hate those fucken 24mm caps! @xeren: I've seen them, they look good but my socket does the same job. It's not really the tool I have issue with, it's the soft af top cap with zero purchase surface. Even patient and less ham fisted mechanics/ tinkerers will leave tool marks cus the ano and ally are so soft. A cassette tool interface seems a far better solution. Why haven't all fork manufacturers done this and use a cassette tool to remove topcaps?!?! I vaguely remember some marz 66's having the same feature and it made getting the top caps off a doddle without marking the delicate anodised aluminium finish on them or slipping like a ham-fisted monkey and scratching the crown. I've been meaning to get a ground down socket sorted for years but have always forgotten until the moment I need to remove a top cap with a slightly ill-fitting rounded nose socket which never quite works 100%. The concept looks great though, I can never be arsed to keep releasing pressure and changing the number of tokens in my Pikes and sometimes I forget to even put more air in before going for a ride where there's bigger jumps and inevitably on the first slightly heavy landing finding the full travel point with a large clunk. Bravo MRP, looks like a better executed solution than the bottom out adjuster on my Boxxers which is just a volume reducer as far as I can tell. @turkeybaconsmellybitches already done. along with shaving excess rubber off the ends of my grips. took a whole 0.5 grams there so this would put me way over the edge. Probably will shave a 1000th of a second off your Strava time. That's pretty good! This is a really f*cking cool product. Especially if you ride a few different trails. Wonder why Fox 32 is not supported? Seems like this would be a category that would benefit the most. @NoahColorado: Patent® this asap. All the brands are going to want it! @NoahColorado: And the Fox 36? @Zaff: Same same, but different. In development. Can I use this with my Girvin Vectors? Yes. It mounts in the left leg. Or you could buy the MRP stage or Ribbon and get it all! Super stoked on the two MRP's I've had/have. They have been absolutely flawless and am usually a set it and forget it guy... but been using the Ramp control all the time! like the other day at Noble Canyon, right before the stone staircase section. Works like a charm! Thanks for the support Skye! We are stoked you have been loving your MRP suspension. The last time I rode Noble Canyon was the week before I started at MRP, definitely need to get back out there for a lap. Hope to see you guys soon! @simcik: Thanks buddy lets ride soon! Another option is just have a coil installed, no more air issues. I have a custom 2016 Lyrik that my shop converted to coil. All in it cost me just over $100 Canadian. Just pick a coil rate and be done with it. The fork has been working flawless for over a year now and feels better than every Lyrik or Pike I have ridden. No issues with pressure, number of plastic bits to add or special damper things. Though this does seem to be pretty slick. @Mieszko42: 200lbs without pack and 220lbs with a pack. The spring is a custom cut Boxxer coil that I believe is a heavy spring. I rarely bottom it and ride it hard. Had an MRP Stage which already has this feature, and loved it. If this were an option for my Fox 36, I would definitely purchase one. @mtnallen: tuned...I see what you did there ???? @mtnallen: will support be offered for older 36's? @defineindecline: I'm not positive yet on all the model years that will be covered. We'll make that very clear though in the product description. Been riding on my Lryik equipped with MRP Ramp Control for a couple of weeks now too, and I agree with you. Recommended. Dial it up a bit on black and double black runs, dial it down a bit on other runs...all at the trail head or riding along. I’m one of the least politically correct people I know but even I know not to use “retarded” as an insult. I lost interest in anything you wrote after reading that. Some of these comments tell me just how out to sea some people are in their understanding of suspension function and setup. Bravo MRP, Having to install tokens and volume spacers is just plain dumb! Why not put the control/adjust-ability there in the first place? And why did this kind of thing come to the fore in the first place. I can think of a number of older designs that had end travel ramp control before (Marzocchi Rocco as an example). Why are so many newer offerings in need of tokens and spacers while having 5h1t mid-stroke support? Looking at you Cane Creek DB Air! I dig mine. If you ride park, total no brainer. The feel is superior to tokens imo, and not having to change setups when I go from big drops in the park, to trail rides with small drops in Moab, this completes me. Love, love, love mine. Glad to hear you're loving it! 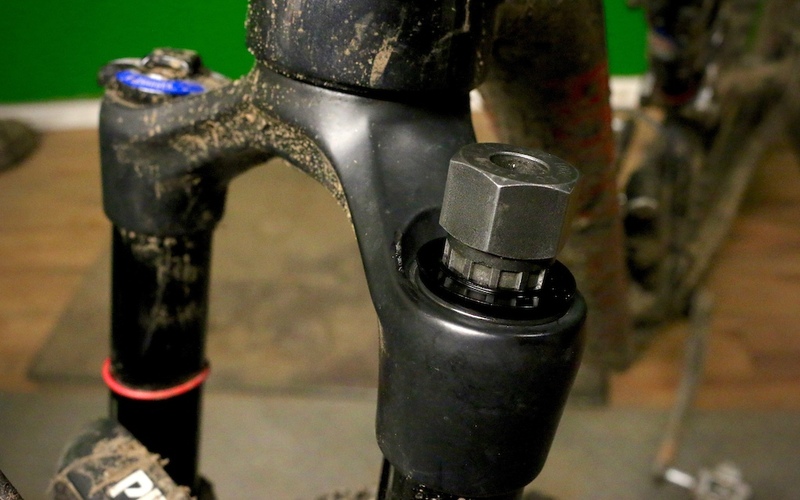 This Cartridge sounds very interesting for fast on-the-trail adjustments. Also the way it works - staying linear in slow compressions and giving more progressivity when the hit is faster. BUT Ctrl + F "awk" - 0 results found. Ok so I will be the one: pinkbike maybe take a look on it? For all those that dont know, its a secondary positive chamber, like the one found in the Öhlins fork reviewed some weeks ago. I think manitou also has an upgrade like this. I have been fiddling with tokens and pressures and compression settings and find the fork too soft between like 40 and 80% of the travel, e.g. when braking on steep terrain and then riding over a root. I like most the linear "no tokens" feeling to it, but then have to use about 120psi to keep it from bottoming out, resulting in a harsh ride. CTRL + F "awk" - try again. "If you didn't bust the nut, you can now pump the fork back up." That's what she said. MRP is a badass company. Ran into them when they were at Outerbike in Whistler. Talked at length about their machine shop, sounds like a rad place to work. @Rucker10 Thanks! Definitely a fun place to work. Hope to see you at some other events this year. We will be attending the Evergreen Bike Festival this summer. I`m a guy who changes the psi depending the course, but the 3 tokens in my fork remain even if this is an xc course, a mountain course or and enduro course. The ramp control gives me the ideea that i can change how the fork acts quickly, but i`m not into it so easily as i can't figure it out how can you change the sensivity and mid stroke with the same psi . In changing your PSI without changing tokens, you are changing your sag. This seems like a compromise - giving up small bump sensitivity in exchange for more progression? Is that what you're after? I am also wondering about loss of mid stroke support, as I use tokens to tune this quality of the fork. Does this mod have any effect on mid stroke beyond the 1-token equivalent volume it takes up? In other words, if we find 1 token inadequate at providing the mid stroke support we want, would we also find the mid stroke inadequate with this mod? @half-man-half-scab: using tokens to tune mid-stroke is not ideal as they're making wayyyy more difference to ending stroke. That said, I have no doubt you could find a combination of air-pressure and Ramp Control setting that would give you the feel you're after in the appropriate situation. Keep in mind you have the adjustability of your damper too. @NoahColorado: The MRP marketing blurb saying that this is speed sensitive. This review doesn't mention this or any effects of such a thing. So is this just simply an external volume adjuster? Re-read the bit at the bottom of the "How it Works" section. Yeah Mike did go over "how it works." But his description of his experience with the product basically said it was more convenient than swapping out tokens for those who like to tinker. He didn't have any mention of improved performance or feel beyond its convenience value. @acali: Let me give you an example. We think our Ramp Control solution is preferable (vs. volume adjustment) for aggressive descenders who want substantial big-hit support, but access those descents via chunky, technical climbs. We have no shortage of this type of riding locally and in the Southwest in general. Setup for my liking in this scenario, the Ramp Control-enhanced fork acts very plush and linear on the climbs - gobbling up rocks and ledges - and keeping me tracking straight. Compare this to a highly-volume-reduced fork setup with a very progressive stroke. In my experience, those forks tend to fight you on technical climbs, resist readily moving freely over obstacles, and push back more the more you push them. Now, switching to downhill performance, these forks feel much the same, but of course you have the on-the-fly tunability benefit only from the Ramp Control-enhanced fork. This is somewhat analogous to the of ride sports car from yesteryear - stiff and jarring at slow speeds, they don't make the best around town transportation, but push them hard and they're great. Whereas the Ramp Control-enhanced fork is the modern sports car, perfectly comfortable plodding around or thrown around in hooligan fashion. Cool! I've thinking of a similar concept for a long while, but that was with another floating piston in the air chamber (so you basically had two positive air chambers). Some damping on that piston would give you a similar effect, but it was much more complex. It requires a separate damping unit somewhere for that floating piston. This is much more clever and less complex. I've got two questions. 1. (And I might have missed this.). How about the rebound stroke, is there damping there as well or does the air flow back into the main air chamber without any delay? It wouldn't be too bad having some delay there as well as that would give you an easier rebound stroke after hard hits. 2. Now that air in the air chamber is being used for damping, have you experienced any issues with the air warming up hence increasing air pressure? Or is this never an issue because of the size and surface for cooling (the stanchions, that is)? The tokens are free, won't fail, and they work just fine. Let's see the Pike with tokens base line dyno with numbers on the charts, not just drawings. Then let's see the numbers on this MRP. What's gain and loss percentage? Also, what was the terrain variables. I'm all for mods, but if there are not much gain and advantages, just another expensive paperweight. Bike and parts are already expensive. I have been running one on my Pike. At less than 150 lbs I need a light spring. That light spring isn't happy when things get hopping. So like Mr. Levy, today mine has a little less air and lots of ramp up. Get this at your LBS if you don't have a 24mm socket and a large torque wrench. I see licensing opportunities here. Nice to see MRP come up with a winner. "replaces your fork's air spring top cap and tokens with a cartridge...Cartridge replaces your fork's top cap and volume-adjustment tokens"
So, for those of us sitting at the back of the class, you remove the top cap and tokens from the fork, and then fit this cartridge. Correct? ???????? First ride today on my home track with the MRP ramp control. Very impressed with the noticeable performance gain. Area of the country: Western NC, Upstate SC - Brevard, Pisgah, DuPont, Paris Mountain - Technical rock, root strewn trails. Here are some of my observations from it. With the same air pressure (67.5 psi) on a Pike 130 I am at 30 MM of sag. With the same air pressure and 4 Tokens I was 18MM and with 3 tokens I was at 25MM of sag. I ran the fork with all the progression out at first to see what that did to the fork. At first the fork in technical sections was a little slow and lazy. So rather than add progression I sped up the rebound. I like the climbing in this set up since the fork is little more in the mid stroke and seems to track better I think since there is less ramp up from the additional volume. The biggest difference was downhills. Anything high speed and the fork tracked noticeable better. Now what do I mean by better. The fork didn't deflect off line, in high speed, high lean corners where your trying to really max speed and have to make a tight radius. Wash boards, chatter bumps, roots, rock gardens, baby heads were all tamer and noticeable the fork tracks smoother without any noticeable bottoming out. Quite frankly the fork became more supple, compliant and predictable. IMO with 2 Tokens and especially 4 tokens the fork wanted to really fight that last 1/3 of travel as the volume became tighter. I ran the fork with +4 progressions (1 full turn) and +8 progressions (2 full turns) and noticed the fork for my riding started to drift off line more and exhibit similar tracking that 4 tokens had. I ran the same trail each time. For me the lower progression really add stability at high speed in very tight switch back/technical downhills. I think for experienced riders you'll suddenly notice that you no longer have to ride in expectation of the rebound/deflection from hitting something on the trail where you manipulate your lines because the suspension/reaction has to be compensated for. For me it was laying down fast tight lines in trees and ending up smoothly where I really wanted to be not off line by some factor. I think you can dial in that mid travel since you're not having to compensate for bottoming out. For me dialing in the mid stroke/travel will start with speeding up the rebound rather than adding progression as I feel that will help in technical sections. I have a Luftkappe to add to the mix and I will report back with that and long term. As a side note I ran +2 progression on the Local Enduro race course and never got the fork to bottom out. The only way I could bottom out was to launch the bike and coming down flat - intentionally. Swagger2, thanks for the review, very interesting. Have you fitted your Luftkappe yet, and if so how does it work as a combo? I have a Luftkappe on my 140mm Yari which I'm loving but thinking about getting the MRP too. Could we have a pb article/video from a suspension guru explaining the various ways you can alter fork performance - compression damping, air pressure / spring rate and spring volume / any hydraulic bottom out adjustment and their relationship with each other. It would be interesting to hear the experts view -e.g run higher pressure, less comp or high comp with low pressure. How many riders are happier to adjust air pressure and volume rather than play with lsc for example. Didn't @VorsprungSuspension do that in one of their latest Tuesday Tune video? I wonder how these changes in spring force influence the rebound? check out andrextr on youtube! and in UK, retailers are selling them £ 129 (TFTuned) and others £139.99 ....... Something wrong with my currenty £££ FTW ! It's over 200 Canadian pesos here so pretty much same as UK. We're (Ison - MRP's UK distributor) sorry about that. Due to a lot of economical reasons the retail price here in the UK is £139.99. The UK Pound is so weak against the Dollar right now, which is having some major effects to pricing over here. @PatCampbell-Jenner: with the Fox36 variant and positive negative chambers to fill how does shockwiz react? Great! Production will be rolling and forks shipping by mid-March. Props to MRP. Nice product. But a lot of people around here seems surprised. That isn't new. Marzocchi forks used progression adjust a lot of time ago. On coil forks. Cool. I would say that this is an innovative product worth mentioning. Officially on the wish list. Can someone educate if this is even needed if a person has upgraded their lyric with the Avy cartridge? I believe it's not needed-- anyone chime in with sound advice? How often do you change the number of tokens in your fork? If the answer is never, then this product has little to no value to you. If the answer is very often, this will make thise changes easier to make on the trail with a greater range of fine tuning than tokens allow. @pacificnorthwet: I figured so, just wanted to make sure. thanks..
@pacificnorthwet: i'm kind of curious as to what it COULD feel like in various levels. its not that i frankly touch my tokens at all, generally because i'm happy (enough) with the way my fork performs, but what if i like it better at the equivalent of 3 tokens or 4 tokens instead of 2 tokens and i just don't know cause i haven't been fiddling... would be nice to just be able to test various settings on a single ride and see. @Sweatypants: I could see way more people trying out different settings if it is as easy as turning a dial to find out what works best for you. @ericwahl83 Dual rate Boxxer springs are being released soon, solves the bottoming of the coil with a ramp in the spring rate! @IrishPirate: that would be the ticket! I'll keep an eye out, thanks! Hmm. So this should drop into my 2014 Sektor??? SID yes, Sektor.....I'll have to get back to you. @NoahColorado: Would it work on 2015 CTD Fox Float Evolution 34 too? I would love to have this on my Lyrik. It's always sweet with faster adjustments. @mikelevy @NoahColorado maybe I missed it, are the muted-color boxes in fork chart compatible? (just muted for non-stock travel configs? Or other?) Thanks! Hmmm,I wonder if this product will mess with warranty claims for fork internals. Frankly, there is no reason it should. But, in most warranty clauses the fine print will reveal something about using aftermarket parts or doing modifications will void warranty, so we have included a disclaimer regarding warranties on our product page. I take it this isn't compatible with the Fox 34 Float upgrade, since the topcap has that rod coming out of it? I've been diggin' mine! MRP does good things. @wang-chung Glad to hear and thank you! @mikelevy Re: Installation, did you Bust the Nut? this is very similar to how Manitou SPV works. Except SPV was on the damper side, not the spring side. Working on it right meow. Bet Fox wishes they thought of this. @NoahColorado: Will it work with Lyrick 2012 model? Now bring one out for the 36 already! just a question what size socket do you need to install this for a Pike? So if I have a fox float 36 Talas CTD with FIT damper, I can add this and have a FOURTH way to adjust my fork? Any X FUSION compatibility ? Is it compatible with a dual position pike??? But would it fit in my 26er Pike DPA? does anyone know if these work with the Dual Position Pikes? Because you don't have enough things to fiddle with on your fork already!? I have one of those friends that stop every mile or so to make adjustments on his fork, we don't ride with him no more. Buy a fox send it to PUSH end of story. Kind of a dull story, but maybe the sequel will be more engrossing? Would make an expensive cow bell! Adding and removing tokens also takes about 10 min and zero dollars. But then you cant re-adjust in seconds, anywhere, anytime with tokens. You do end up re-adjusting to suit trail conditions just because you can. I know, because i have one. But can you do it in the middle of a trail with zero tools and the turn of a knob? It also gives you way smaller incremental changes. Each click is about the equivilent of 1/4 token, which makes for much finer tuning than the token system allows. On the fly adjustments would make it much easier to dial in the perfect ramp up since it is so fast and easy to make the changes. @wpplayer18: Is there an echo in here? Also, this is not the same as tokens. it's controlling air flow, not making a smaller chamber(beyond the 1 token of space it takes up.) 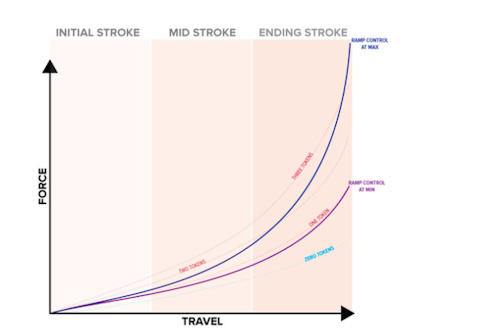 That makes it less prevalent on low speed movements, but more prevalent at high speeds, but due to the higher pressure deeper in the stroke, it's also more prevalent at the end of the stroke. at some level, it's both speed & position sensitive, tokens only change the volume, changing the spring rate from top to bottom, & their effect on the top of the stroke is generally not a positive(you don't really want progressive on smaller hits.) The MRP cartridge is going to preserve most of the linear feel of a pike with one token on small impacts, with the same amount of ramp as more tokens big ones. Conversely, is it undeniably conceivable to execute amendments in the center of a path with naught a single instrument of repair, and merely the rotation of a dial? @stumpymidget: Is there an echo in here? @atrokz: fu*cking hell mate, that's the most beautifully constructed sentence I ever had the pleasure of reading on pb, so far. Well done! Intriguing stuff, I reckon here comes the age of mods. Soon. Ish. @wpplayer18: I dunno, turning your knob in the middle of a trail sounds like a recipe for cross-eyed pain, if not arrest. @truffy: don't knock it till you've tried it!